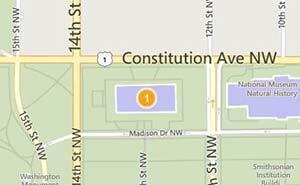 The Museum is located on the National Mall at Constitution Avenue, N.W., between 12th and 14th Streets, Washington, D.C.
For driving directions, use 1300 Constitution Avenue NW, Washington, D.C. The use of public transportation, including taxis, in Washington is recommended as free parking is limited and posted times are enforced. Metrorail, Washington's subway system, and Metrobus link the city with nearby communities in Maryland and Virginia. The Federal Triangle and Smithsonian stations, on Metrorail's Blue and Orange lines, are located near the Mall. Every subway station is equipped with an elevator and most with escalators. There is no public parking facility at the Smithsonian on the National Mall. There are a limited number of 3-hour limit, on-street parking spaces near National Mall museums along Jefferson and Madison Drives; for visitors with disabilities, vehicles must display the appropriate plate or permit while parked in designated handicapped parking spaces. There are numerous commercial parking lots throughout the city. The Smithsonian is happy to partner with ParkWhiz to help our customers reserve a parking spot near the museum in advance. The official bus drop-off site is Madison Drive on the Mall (south) side of our building. The Smithsonian has no parking for buses. The District of Columbia Department of Transportation (202-727-1000) may have bus parking suggestions. Two bike racks are located on the Constitution Avenue side of our building, in front of the fountain, and two bike racks are located on the Madison Drive (National Mall) side of our building.